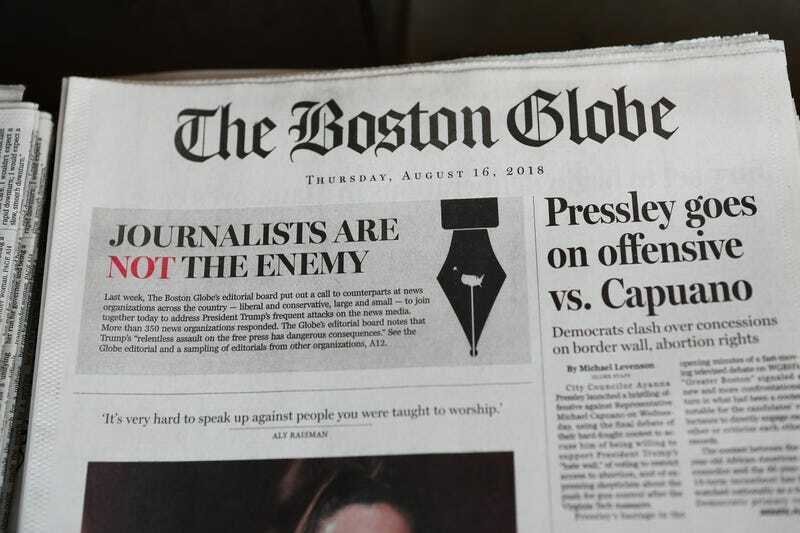 The front page of the Aug. 16, 2018, edition of the Boston Globe reads “Journalists are Not the Enemy” as part of an effort by newspapers to jointly decry Donald Trump’s description of the media as the “enemy of the people.” Now, in what’s being seen as a similar anti-press move, GOP lawmakers in Georgia are looking to put mandates on the press. The Constitution seems to have weighed heavily on the minds of Georgia lawmakers over the past week. First, lawmakers went after the 14th Amendment by effectively outlawing abortion in the state with their “heartbeat” bill. Now, they seem focused on the First Amendment. Georgia House Bill 734, sponsored by Republican state Rep. Andy Welch, would create a media oversight committee and mandate that media outlets turn over to anyone reporters had interviewed the photos, audio or video footage that had been gathered. News outlets refusing to do so could be sued or face other civil penalties. “First I thought this was an April Fool’s joke, but this is clearly an effort to rein in those who have been scrutinizing what’s been happening at the Legislature,” Richard T. Griffiths, president of the Georgia First Amendment Foundation, told the Atlanta Journal-Constitution. “In this country there is a First Amendment which reads, in part: Congress shall make no law … abridging the freedom of speech or of the press. This applies even to the Georgia Legislature. Perhaps ironically, Welch, a lawyer who recently expressed frustration with the questions he received from a reporter about some legislation, announced his resignation from the Assembly after the session ended. However, his bill, which also has the support of five other Republicans, will still be considered during the Legislature’s 2020 term, the Atlanta Journal-Constitution notes. But whether it becomes law or not, the bill is “unconstitutional on its face,” media lawyer Derek Bauer told the CNN. “Simply put, the U.S. Constitution forbids assertion of government control over the free and independent press such as this bill attempts to do,” he said.